Swiss Food Delivery is the best online food ordering site in Switzerland. It connects people and the best restaurants together. Swiss Food Delivery has the utmost reach. You have to enter your post code and can search for cuisine type, restaurants or even price. The restaurant index also includes address and delivery hours. No online food delivery is excessively troublesome for Swiss Food Delivery. Teliver has played a vast role in the making of it as a brand. Swiss Food Delivery operates an online and mobile marketplace for food delivery, providing consumers with a simple and secure way to order and pay for food from local restaurants of Switzerland. Swiss Food Delivery now handles several orders a year and has reformed the process of food ordering for more and more customers. 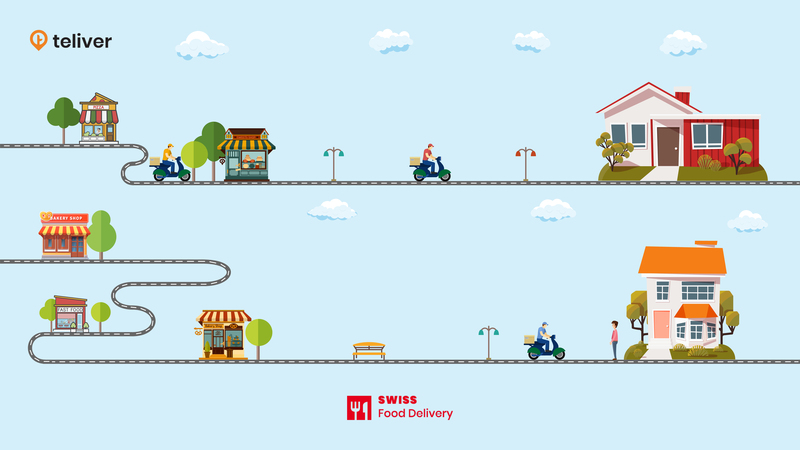 Thus Swiss Food Delivery helps to order your favorite food online and have it delivered to your doorstep in no time. Pick the best restaurants near and find most extensive assortment of foods and appreciate the quickest delivery service. Once the order is booked by the customer, it reaches the Teliver system. All the drivers available with their location can be viewed by the Admin in his application. Admin can assign tasks to the nearest driver. The task will reach as notification to the driver via his application and the driver can accept or reject the task. Once the driver accepts the order he will pick the food and it will be delivered to the customers within an hour. By using Teliver, delivery service becomes easier. Admin can live track drivers whereas customers, drivers and vice versa. Thus Teliver, a customized solution helps Swiss Food Delivery to improve their business in a clear-cut and problem free manner. Teliver is a Saas based continuous live area following arrangement. Teliver can be utilized in any kind of conveyance sevice regardless of what number of conveyance people you have. Teliver contains a module TASK that gives the best approach to deal with your conveyances in different means. The administrator should enlist driver in his application. The driver data incorporates driver name, driver id, and mobile number. Teliver gives API’s to make a driver and all modules of the administrator application are as of now accessible as Teliver strategies. This works by booking and affirming the request once the driver is doled out. Teliver API’s assumes a powerful job in client application. For all the primary modules in client application the Teliver can be incorporated effectively. Client can track the driver area in maps effortlessly by incorporating Teliver. The driver application comprise of modules embodied, for example, demonstrating the relegated booking, driver acknowledged booking and beginning a ride. All these should be possible utilizing TELIVER. In this way Teliver assumes an indispensable job in conveyance administration of Swiss Food Delivery and robotizing the procedure. Is it genuine that you are chasing down a platform that gives Live tracking API, SDK? By then Teliver is the right choice. Immediately contact us and we are prepared to help.